Thanks to an amazingly cheap fare on Virgin America, I find myself eating my way through the midwest city of Chicago. I typically don’t like summer traveling – unbearably hot temperatures, excessive crowds with screaming children, and high prices usually keep me homebound during this time of year. However, with the cheap fare ($99 one way!!! ), I thought I could make an exception this time. 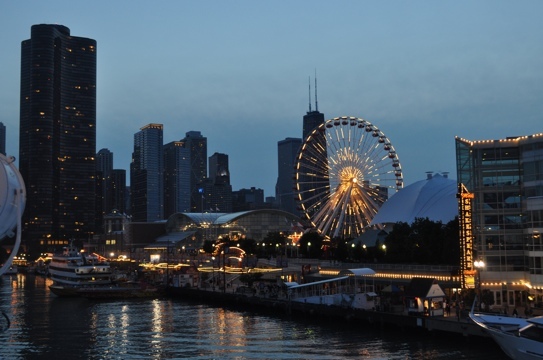 We arrived, bleary eyed, on Saturday afternoon, and were confronted by one of the worst characteristics of Chicago – the traffic. What should have taken us 1/2 hour by car ended up taking over an hour! The fact that the Gay Pride parade was happening close by did not help matters any. However, once we got to our apartment in the quaint neighborhood of Lincoln Park, things got better. This neighborhood is adorable, like Union Street in SF with the restaurants and boutiques, but with more trees and brick and less attitude. As much as I’d love to stay in this area to shop, relax and eat, other parts of Chicago beckoned. 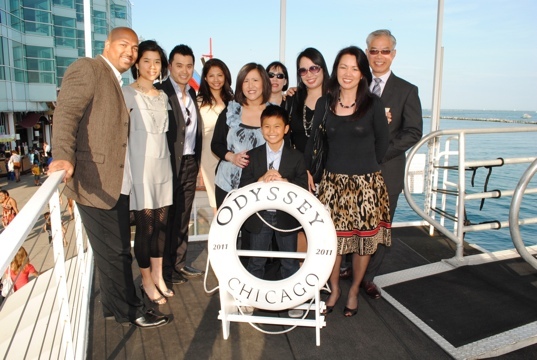 On Sunday evening, we took a lovely dinner cruise on Lake Michigan. And although Lake Michigan is a “lake”, it’s so huge that you can’t even see the other shore! It truly was a perfect night to be on the waters – warm and calm. Monday was spent at the Museum of Science and Industry. The MSI (for short) is famous for their U-505, the only German submarine captured by the US in WWII. It was huge and the history surrounding the U-boat’s capture was fascinating. 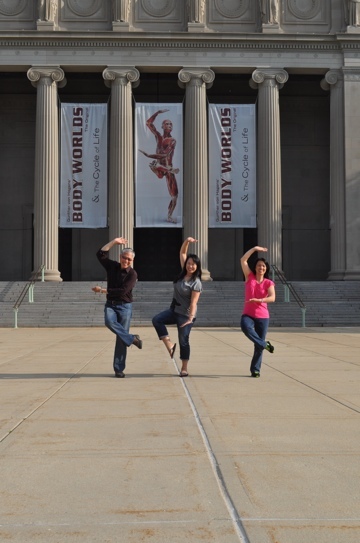 Even more fascinating, though, was the Bodies exhibit. I’ve been wanting to catch this exhibit for the longest time, as it has travelled to cities around the US, but this was my first opportunity to do so. And it was fascinating to see the cadavers in different forms, preserved in plasticine. My favorite one was a cadaver doing the splits, balancing his feet and one arm on 3 spheres, while his third hand is holding his internal organs up in the air. Having dissected cadavers in PT school, I really appreciated the hard work and detail that must have gone into each one. And it truly was like an anatomy review where I was like, “Oh, there’s the tibialis anterior”, and “there’s the erector spinae and the multifidi”. 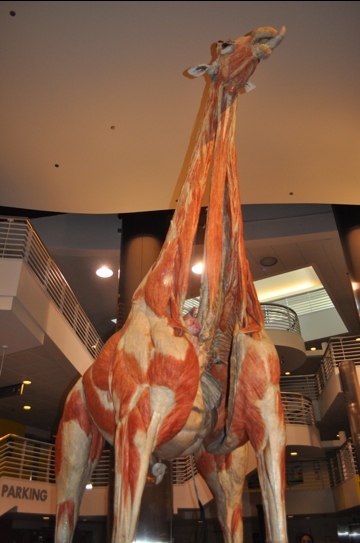 What can I say – I guess I’m sort of an anatomy geek. So cool! 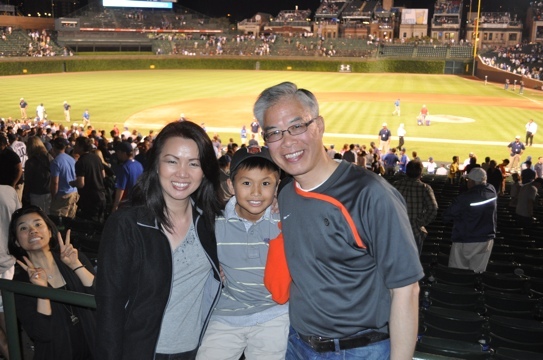 Then yesterday was truly a highlight – seeing our beloved SF Giants play the Cubs at the historic Wrigley Field. 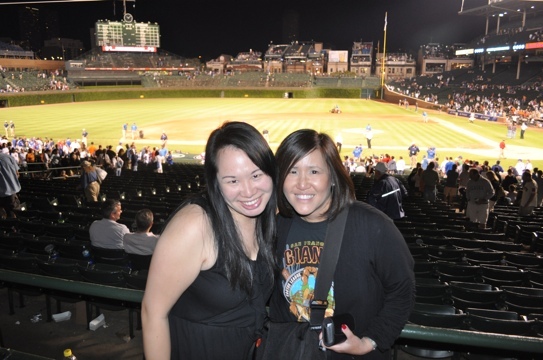 The only problem with “historic” ballparks – for nostalgia you sacrifice comfort. There was a pole obstructing the batter’s box from one of our seats. There is no jumbotron and the overhang blocked the scoreboard. However, it was a great game. 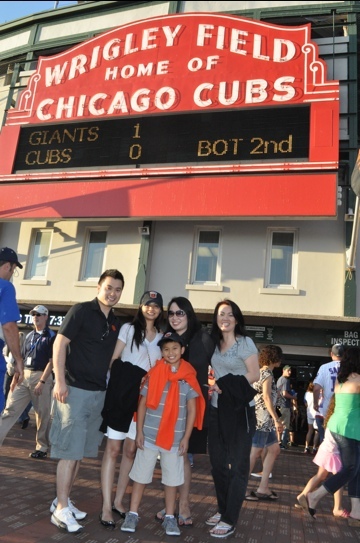 I was actually surprised at how many Giants fans there were – I had a few people to cheer along with. When we first got there, the Giants were leading 1-0. 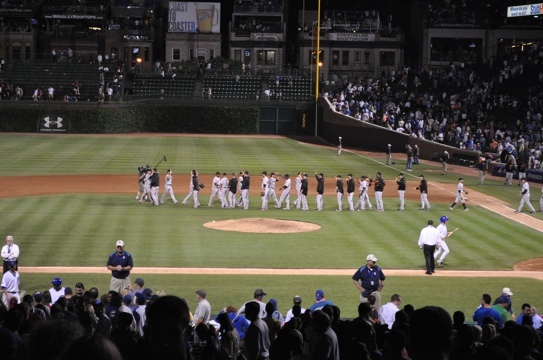 However, the Cubs came back to make it 2-1. I was a little worried, thinking that the Giants had used up all their runs in an earlier game (the Giants had already won the afternoon game of the double-header 13-6). But our beloved G-men came through, helped by the bat of one of my favorite players, Cody Ross, and we ended up winning 6-3. And as many things I had said previously said about Barry Zito (mostly negative), I was impressed that he came through. 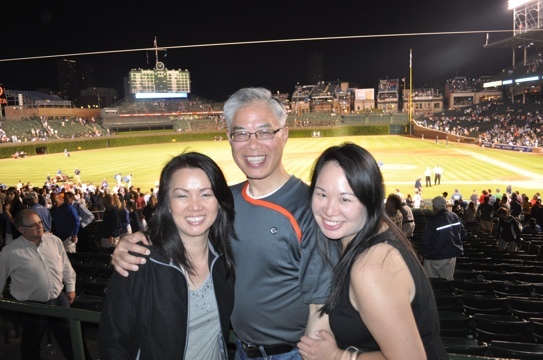 It was a perfect night – warm weather, great atmosphere, and capped off by a Giants win.